1. Preheat the oven to 200°C, gas mark 6. Divide the sunflower oil between 2 non-stick oven trays and place in the oven to preheat. 2. Leave the skin on the potatoes and cut into 5mm-thick slices then cut into 5mm-wide, long thin chips. Rinse under cold water and then pat dry with a clean tea towel. 3. Remove the hot trays from the oven and add the chips in a single layer, along with the bashed garlic and rosemary. 4. Place back in the oven to cook for 30-35 minutes until golden and crisp, flipping halfway through and swapping the position of the trays in the oven. 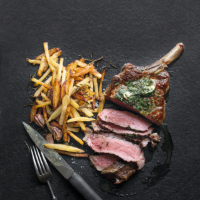 Season and serve immediately with the côte de boeuf.